I find that few places in Chinatown do decent Asian desserts which is ironic because its exactly after the usual hyper-tasty, MSG-packed Chinese meal where one tends to need and crave dessert more than ever. This little first-floor cafe hidden just off the main stretch on Macclesfield Street though is seeking to stir-up an oriental dessert craze in London and join others like Bubbleology to tap a market previously dominated by Cafe TPT. It’s a little cramped for space seating wise, and you will have to mind the strong student following and Jay Chou-dominated MTV playlist blasting in the background. 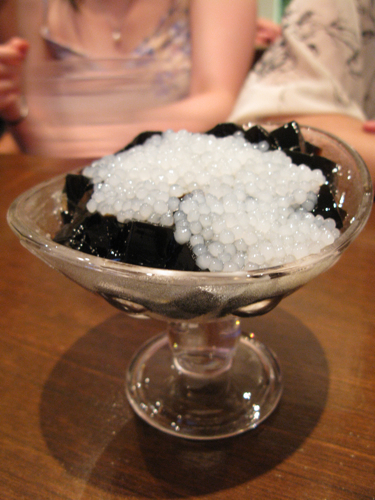 What you do get though is an immensely wide selection of Asian speciality desserts and drinks… everything from Taiwanese Bubble teas to Ai Yu Bing (Lemon) jelly… Red Bean Grass Jelly to Mango Sago Pearl. And best of all, everything here is under £5. I had the Matcha Azuki, one of their specialities which comes with Matcha flavoured shaved ice, Matcha Ice-cream, Ai yu bing jelly, red bean and cold glutinous dumplings. It’s creamy… it’s green tea-ey… and the lemon jelly adds that fresh zing to cut through the sweetness. Just fabulous. 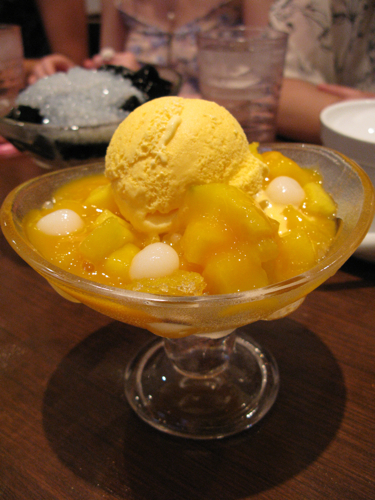 Other house puddings include the rather cheesily named Mango Lover – a combo of mango ice-cream, shaved ice, mango juice, fresh mango, tapioca and glutinous dumplings. Again, way too much goodness in one bowl. If none of the house combinations tickle your fancy, you can even make your own by choosing from a base of either Soya pudding, Milky grass jelly or Sago Coconut Cream and add fruits, beans, tapioca pearls, aloe vera jelly and many others to your heart’s content. 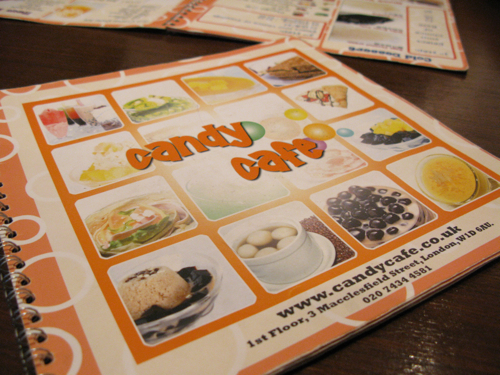 All in all, it’s hard not to feel happy when you’re at the Candy cafe. It still ain’t a match for the great Taiwanese dessert joints you get in the far east, but by London standards, it will do. 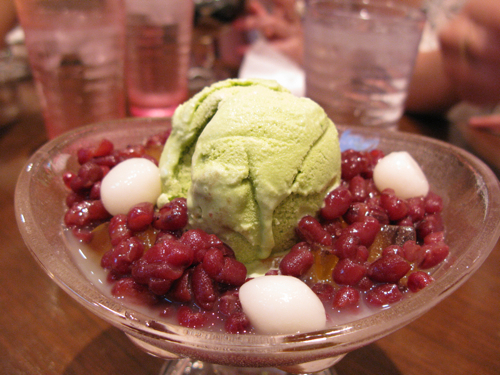 I must admit i’m a bit late to the whole bubble tea phenomenon, the desserts here look fresh, tasty and intriguing. Will seek out. Louis: they do a lot more than just bubble tea here! Let me know how it goes if you get round to trying this place out! My favourite dessert there is the Mango Lover, I must admit I prefer to take away as the place is sooo teeny. haha loyalty card!? i want one of those!